By now, we know whether we’ve been drawn for any of the fall hunts. My son Sam was drawn for a youth elk hunt near Heber, and I was drawn for my first bull elk hunt near Flagstaff. So I have two elk hunts to get ready for. Dreams of the fall have been filling my consciousness in this summer season. This happens to me every summer. It’s interesting how those few days in the fall can actually last for months when the preparations and anticipations are taken into account. After the fall hunts, the hunting rifles get cleaned, stowed, and generally put out of mind. But when the draw results come out, hunt fever again grips me with a vengence. My interest in big game rifles again comes to the fore … I start watching the Outdoor Channel and hunting videos again … I start combing through my reloading books … I start reading my hunting and rifle magazines more thoroughly, searching back issues for specific articles … I buy bullets, powder, primers, and start loading up hunting ammo. Sam will be taking his brother’s aught-six on his hunt. Sam has started hand loading his own ammo. We’re going to work up a load using the 168 grain Barnes Triple Shock X-Bullet for Sam’s antlerless elk hunt. “Work up a load.” That in itself implies a certain level of effort for hunt preparation. It means loading up a number of rounds at various powder charge levels, taking them out, chronographing, and firing for group size. Then when we’ve decided on a particular load, we will need to make up another batch for the hunt. Rifle work in preparation for a hunt does not stop there however. Once we have settled on a load at a known velocity, we will run the numbers on ballistic software to decide how we will zero the rifle for the hunt. .30-06 trajectory is a familiar curve in this household, so analysis will not need to be extensive, but a quick verification that a 2½” max mid range rise will work for this particular bullet is all we’ll likely need. At what range does the load, at this velocity, zeroed thus, drop below an elk’s vital zone? Then we will head up to higher country for the final sighting in, combined with some field practice using a comparable load with cheaper bullets. 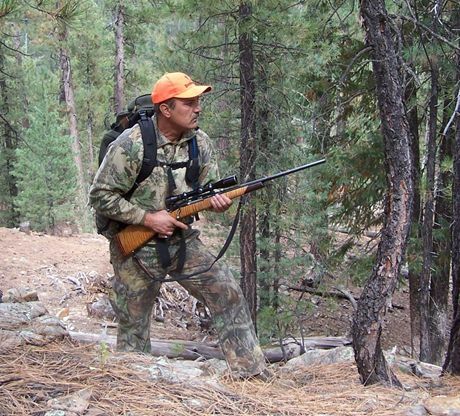 For a western hunter and rifleman, lazy late summer days in the high country practicing shooting across canyons and meadows (making sure of a safe backstop) is close to heaven. As for myself, this rifleman could not resist the temptation to celebrate his first bull elk tag with a new mission-specific elk rifle. Certainly, in the .30-06, I had a perfectly adequate rifle for hunting bull elk, but I succumbed to rifle fever and picked up a new Browning X-Bolt in .325 WSM. I’m just accumulating all the stuff to get it running right now (dies, bullets, scope, mounts, rings, etc. ), so I can’t tell you much about it yet, but rest assured that you will get full and complete details in the near future. Hunt prep doesn’t end with riflework alone, either. I applied for the Flagstaff unit because when I recently hunted mule deer there, I was covered up in bulls instead. I know where I’m going to hunt. However, we don’t know much about hunting the Heber area at all, so a couple of scouting sessions will be required prior to Sam’s hunt. We’ll be putting quite a few rough miles on the hunting truck. Long deferred maintenance will need to be attended to. I did suffer a breakdown just as we were arriving in the area for Sam’s hunt last year. That can really throw a monkey wrench into your hunt, believe me! Vehicle maintenance can be quite expensive these days. I try to do as much of it myself that I can, to save on the high labor cost of the service technicians, but there’s only so much that I can do in my driveway. The hunts are still a couple of months away, so I still have time to plan and space out the work needed to ease the financial crunch. But there is the key – make your plans now. Execute your preparations as early as you can. That way, when the hunts finally get here, you’re not up against the wall, rushing around to get things done.